Posted on August 19, 2015 at 2:34 pm. 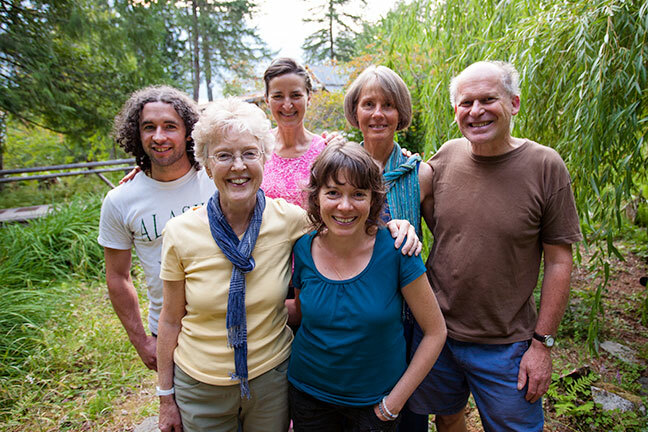 Yasodhara Ashram continues to evolve from a core strength of learning, teaching and commitment. This month we are seeing many Yasodhara Yoga teachers return to refresh their understanding, while others dive in for the first time to our unique teacher certification courses. Long-time practitioners continue to step forward and commit deeply to the spiritual lineage through initiations. Inner strength that arises from a strong centre allows the Ashram to create a light flexible structure for diverse programming – from teens to ecological groups, from “Taste of the Ashram” lunch & yoga drop-ins to a three-month intensive development program. We are also extending externally through outreach workshops in various cities and presentations at conferences, such as the Parliament of World Religions. The Ashram is built on a spirit of openness to all traditions, symbolized by the Temple of Light, which is silently moving toward manifestation once again. Pictured here are six Yoga Development Course (YDC) 2015 graduates who took up our offer to stay on after the course. Karla Fuhr (front, right) speaks of her learning in the YDC and after. I think I’ll always look at my life as “before the YDC” and “after the YDC.” The course was intense but in a gentle manner. Through the teachings I learned to find my own answers, what is meaningful for me. The YDC offered me an opportunity to dive deeply within, to get really clear about myself and to be able to express it without getting caught in emotions. That’s a huge development. My relationships, especially with family members, are more honest. We approach each other at a more authentic level rather than from our roles. Also the relationships within our YDC group were special. We learned so much about the truth of each other. The value of listening and being listened to is incredible. And we were supported and held by our teachers and by the community, which contributed to my breakthroughs. Staying on at the Ashram after the course, I experience the same kinds of situations as I would outside, but here I can go a little deeper because everyone supports my growth. I would encourage anyone to do the YDC. 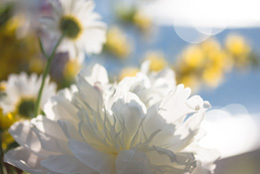 It’s a gift to yourself – transformational in a very positive way that expands and enhances life. Our next YDC begins January 8, 2016. Read more about the Yoga Development Course and the follow-up five-month option. Just a few more days left in the Online Art Auction, with bidding closing at 5 pm Monday, August 31. Place your bids now as we anticipate a lively flurry of activity! 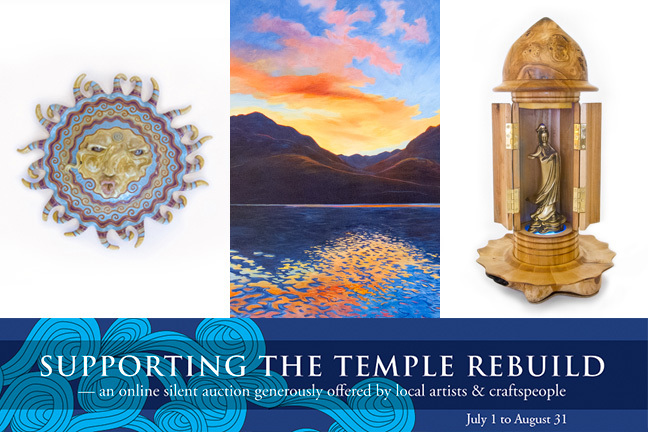 The auction, which is raising funds for the new Temple of Light, offers an amazing opportunity to bring home beautifully-made crafts and exceptional original art – some pieces valued at thousands of dollars – and all generously donated by local Kootenay or Ashram-associated artists. View each artist’s work and words – place your bids – and see if you end up with your favorite. By supporting the auction, you not only honour the artists and acquire quality work, but you also gain a memory of your contribution to the new Temple of Light – an important symbol of peace and unity among all spiritual traditions. Currently the Temple is in pre-construction phase with plans to begin building in spring 2016. Thank you for your support. And sincere gratitude to our community of artists, friends and donors! Stilling the Mind Retreat: What is the mind? What are its tendencies? How can it be directed? You will learn various practices – including visualization, breathing techniques, concentration and reflection – to help you understand different levels of mind and to approach the mind’s expansive potential. The natural beauty and silence of the Ashram support your search for this silence and beauty within. Conscious Aging: Give yourself time in the tranquil, natural setting of the Ashram to reflect on your life and your next steps. Allow space to ask yourself questions, such as, What do I want to do with the time that is remaining? What is the purpose of my life now? What is my new perspective and how do my priorities need to change? Living the Practice with Swami Radhananda: How do you maintain the ideals of yoga in your daily life, in your family, in your work, in your community? What would it mean to accept the challenge to change, open your heart and mind, and live life fully? Swami Radhananda, author and spiritual director of Yasodhara Ashram, will help you explore how a life infused with practice and self-inquiry can become a life of meaning and potential. We bring the Ashram to you! Swami Matananda is offering three workshops in Calgary September 25-27: Tools for Transformation, Relaxation & Renewal and Stilling the Mind.This fall Swami Samayananda and Swami Matananda take the teachings to Eastern Canada with a weekend retreat plus workshops in Toronto, Ottawa, Montreal and Halifax. The Canadian Wildlife Federation (CWF) recently brought educators from Eastern Canada to British Columbia as part of their Summer Institute’s professional development. 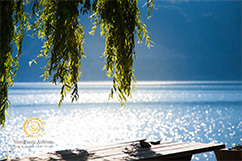 Randy McLeod, CWF Education Manager, explains why they chose Yasodhara Ashram as one of their first ‘magical mountain moments’. To me this was a logical fit to get people started into our Summer Institute. 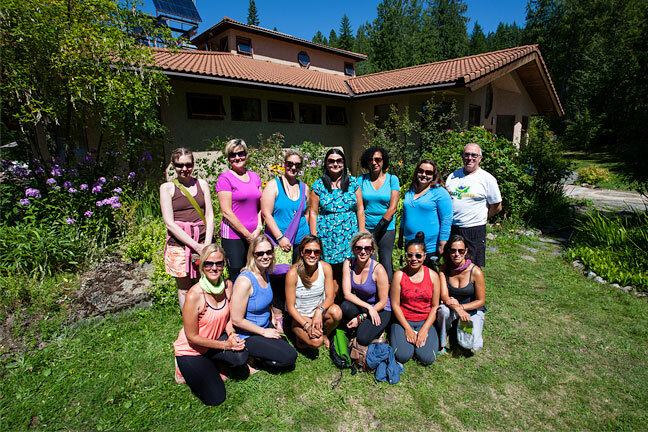 Yasodhara Ashram is one of the leading mainstays here in the mountains. I knew the teachings are incredible, the people here are friendly and welcoming, and the food is fantastic. The healthy care of the land and visioning for the future also present a good model. I wanted to show people that you can find connections everywhere. Who would have thought an Ashram would link perfectly with the Wildlife Federation? But we’re actually all looking for the same thing – respect for ourselves, the land, the wildlife. We are all in this together. Also as educators we often forget about our own personal wellbeing because we’re so wrapped up in those we’re teaching. Being at the Ashram is a chance to say, ‘It’s all right for me to relax, too.’ The lessons learned here by our educators are phenomenal reminders. Bring your group to the Ashram for a customized program to suit your needs. 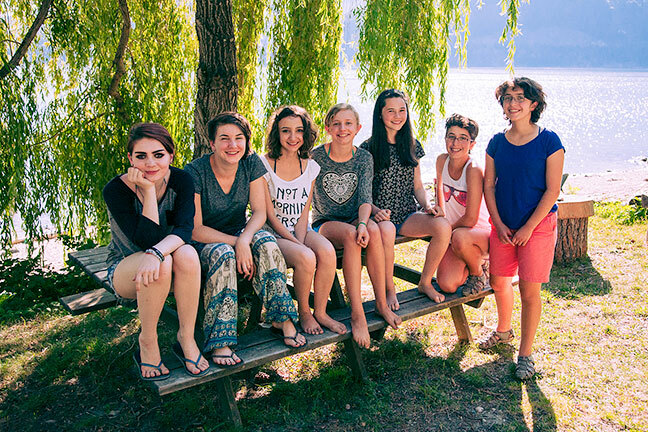 This year’s seven teen girls who attended Shakti Camp were inspired by Amy Allcock’s introduction of photography as a way of exploring self-image. The teens explored beauty with words and photos — Where do you see it? What are its qualities? What is inner beauty? Then they photographed their answers to the question: What are three things that make you special and unique? View their images to see an intriguing mix of closeness, growth, friendship and humour. Many adults started their connection with the Ashram through the teen program, which is filled with dance, arts, hiking and swimming as well as Hatha, reflection and group discussions. Keep Shakti Camp in mind next year for an adventuresome teen in your life! 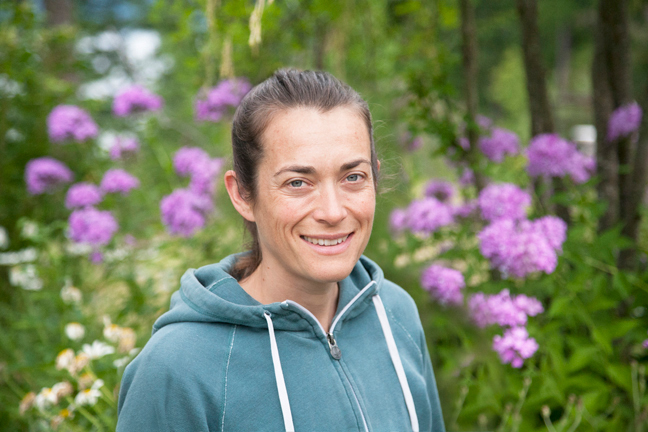 Over the past five years of teaching in the Yukon, Selena Burton has returned to Yasodhara Ashram each summer to help her understand and meet the challenges of her work. Anytime there is a dynamic of fourteen to twenty kids, it can end up being a spinning beehive. It’s important to be clear what my triggers are so that I’m not working from a place of reaction. At Yasodhara Ashram, I have a good look at what’s happening inside me. This is helpful not only in my interactions with kids, but also with teachers. The Ashram gives me the ability to listen to the voice inside. With my Life Seals last summer, I noticed things I wanted to change in my life. This summer I did the Relaxation Retreat, thinking not a lot would come up because it was an easier teaching year and I was just going to relax. That concept was blown out of the water! Being more relaxed and having space to think about things, my body was able to process past “stuff” that had accumulated at a deeper level. Coming to the Ashram allows me to be nurtured and feel good about myself, to peel back layers so that I feel relaxed, whole and healthy when I start teaching again in September. On September 7th and 8th we will celebrate Swami Radha and our Saraswati lineage. 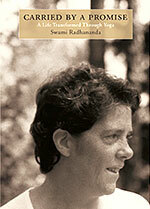 This special time also marks the 20th year since Swami Radha’s passing into Light. We hope you can join us! In anticipation of the celebration, we offer a brief overview of this brilliant woman. Swami Sivananda Radha (1911-1995) is the founder and spiritual inspiration for Yasodhara Ashram. 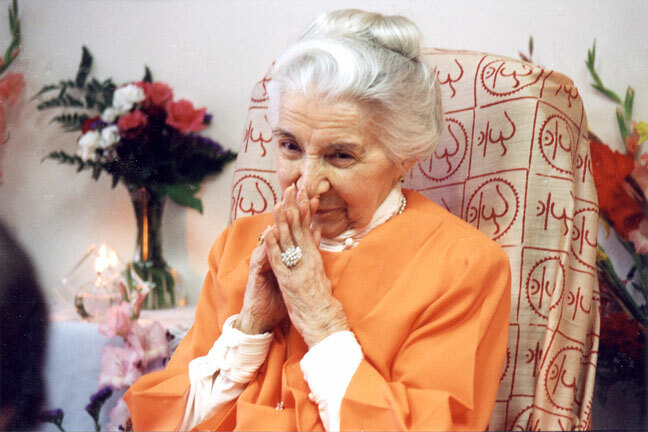 A pioneer in the development of yoga in the West, her approach was distinguished by her unique ability to synthesize yogic teachings and Western psychology. A student of Swami Sivananda of Rishikesh (whose birthday was September 8), she was initiated by him into the sacred order of sanyas (renunciation) in 1956. Her legacy of teaching is preserved by her many books and recordings. Her teachings emphasize that the Divine Light is shared among spiritual traditions, and that the path of yoga is open to all. 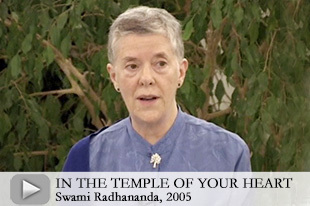 Swami Radha’s inspirational vision – for a Temple open to people from all spiritual traditions, a centre of Light, hope and unity – continues to guide us today. We are honouring her vision by ensuring a Temple of Light stands for future generations and Yasodhara Ashram continues to be a spiritual home to all who come. See more at temple.yasodhara.org. If you can join us for the September 7-8 celebrations, register online, email registrations@yasodhara.org or call 1-800-661-8711. If you can’t be here, consider honouring the day wherever you are. Parliament of World Religions – Swami Lalitananda will be presenting a session on the Divine Light Invocation at this conference held October 15-19, in Salt Lake City. “I’m so happy to offer the Light! It’s a practice that can speak to all traditions,” says Swami Lalitananda. The one-hour workshop will be part of this large event, which is expected to draw 10,000 people from 80 countries and 50 faiths, and features His Holiness the Dalai Lama as a speaker. Yasodhara 108 Fundraiser – What will you offer in the Yasodhara 108 friends-asking-friends fundraiser this fall? Pick your favorite practice – art, mantra, photography, Hatha, acts of kindness – and commit to doing 108 of them, anytime between September 18 and October 18. Ask friends and families to support you in raising funds for a worthy cause, the Young Adult Program. Watch for sign-up details in early September. New Brahmacharis – Swami Radhananda recently initiated three long-term Yasodhara teachers into brahmacharya. We delight in welcoming Draupadi (Mary-Ruth Green), Uma (Nicolette Smith) and Bhavani (Tara Naraynsingh) to their deeper commitment in the lineage. Hidden Language Hatha Yoga Teachers -Nine teachers completed a two-week Hidden Language Hatha Yoga certification program. Individuals came from as far away as Trinidad and England, as well as from the United States and across Canada. The group appreciated how much they learned from each other and from the experiential process of teaching classes to everyone at the Ashram. See the glowing new teachers here! 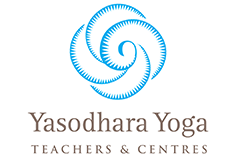 Find a Yasodhara teacher near you at yasodharayoga.org. Celebrating the Inner Temple – On August 7-9 we gathered for a joyful celebration that offered both an internal focus and a community get-together. On Saturday, Swami Jyoithananda led us in a workshop reflecting on our inner sacred space then creating unique temples out of clay. On Sunday, we enjoyed an old-fashioned dress-up picnic followed by sack races, three-legged races and egg and spoon relays. See the Facebook photo album for the fun! More Taste of the Ashram – We have extended our popular Taste of the Ashram and overnight option to include September 5, October 3, November 7 and December 5. Join us for a yoga class, lunch and guided tour of the grounds. The overnight option includes two hours of Karma Yoga followed by dinner, satsang, overnight accommodation and breakfast.